Join the Sleepover Club: Frankie, Kenny, Felicity, Rosie and Lyndsey, five girls who want to have fun - but who always end up in mischief! 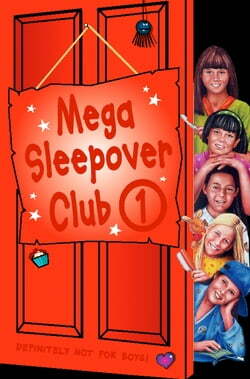 In The Sleepover Club at Frankie's, the gang decides to set up Brown Owl with Dishy Dave the school caretaker. But playing Cupid isn't as easy as they... read more think... It's Lyndz's birthday in The Sleepover Club at Lyndsey's, and the gang plan a spooky video night. Only the spooks suddenly seem for real... And in The Sleepover Club at Felicity's, Fliss goes diet-crazy. But sleepovers and food go hand in hand, and the girls must find emergency supplies!